For many virtual desktop users, the most frustrating time of day is the morning. This is when users arrive at work and, en masse, attempt to boot up their virtual desktops. This can trigger a so-called boot storm. During a boot storm, the demand is too high for the network to handle effectively, causing sluggish performance and driving users—who are just trying to start their workdays on the right foot—crazy. The morning is not the only time when high demand can cause a virtual desktop infrastructure (VDI) to underperform. When we work with companies that are experiencing an unacceptable lag in their VDI, we also look at other peak hours throughout the day, such as in the early afternoon, when users return from lunch and check their email. 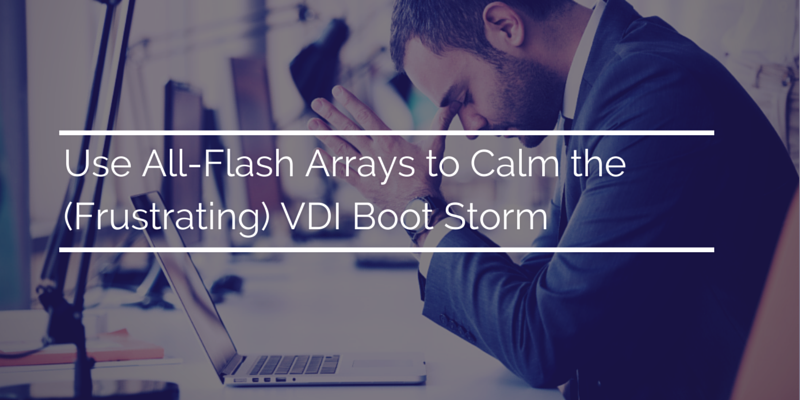 Boot storm and VDI slowdowns are frustrating for users because the tasks they normally expect to perform with ease on their computers—checking email, running common applications like word processing and spreadsheets—become painful. The result – VDI gets a bad rap and productivity drops. For directors of infrastructure, the boot storm scenario can be a nightmare. Desktop virtualization has many advantages, among them easier system management and centralized security and data protection. But, these advantages can quickly come undone if the VDI fails to deliver a satisfactory experience to users. We have found that the most common bottleneck in VDI is with storage. Traditional spinning disk storage works fine in individual desktops and laptops, but when it becomes part of a hardware architecture shared by hundreds or even thousands of users at any one time, it simply lacks the performance capability. The only way to compensate is by investing in more and more capacity, expanding the storage footprint by ever-increasing amounts. Speed - Powered by solid-state drive technology, all-flash arrays perform by orders of magnitude faster than traditional arrays. With all-flash, latencies can be slashed, from milliseconds to sub-milliseconds. Data Reduction - Two inline data reduction techniques, deduplication and compression, allow all-flash arrays to do more with less capacity. This is especially useful for VDIs, where multiple desktops are composed of a large percentage of the same data. Inline deduplication enables all-flash arrays to avoid writing identical data over and over again, instead, merely creating a pointer to a single instance. This saves storage space and vastly increases the effective capacity of an array. So, how do you fit flash into your budget? While it’s true that all-flash arrays are more expensive than traditional arrays on a strict cost-per-terabyte basis, on a cost-per-IOPS basis, we often find that all-flash arrays are more affordable for a growing number of workloads. User acceptance is key to making any VDI deployment a success. And yet the benefits of VDI can be quickly undermined if performance becomes an issue. Because boot storms and other peak-time slowdowns can be so harmful to a company’s productivity (and to the “VDI reputation”), all-flash arrays should be given serious consideration, particularly for companies with large numbers of VDI users. Matthew Trottier is a Senior Consultant Daymark Solutions and Manages the Virtualization practice. Matt has more than 10 years of experience designing and implementing virtualization and storage solutions for Daymark’s customers. Prior to Daymark, Matt held senior engineering positions at JJ Wild, CNT, and Articulent. Matt holds the VMware VCAP-DCD certification and has several storage certifications from EMC.